Dish Network Took my Zombies Away | We Zombie! ← Is the Zombie Apocalypse Here? Dish Network and AMC Networks are battling out their differences in court this fall, but wanting to bring attention to their side of the story, AMC has released a video hoping to take a bite out of Dish and encourage them to settle out of court. 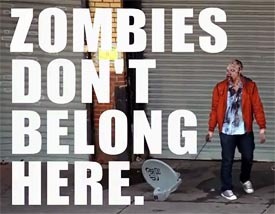 The video features zombies walking around New York as paramedics, firemen, postmen and regular folks scaring unsuspecting citizens. A punchline at the end reads “Zombies don’t belong here – put them back on TV!” while a zombie drags a Dish Network satellite dish across the sidewalk. Not too subtle and very effective – the video has over 4 million views in 5 days. They’ve even set up a website, putzombiesback.com to help with the campaign – and to help you switch your cable provider so you can watch The Walking Dead on October 14th. This entry was posted in Fresh, Movies/Music/Audio, News/Events. Bookmark the permalink. > I seriously need require read A novel by John Green in the near future. one can take while reading a book which you must _ expect _ to be moved by. storey for altogether of my primary and Jnr mellow age. Exchangeable to Ben, I ulterior establish potential difference and incredible motivating in me-against-me sports and activities. issues. When I look at your blog in Chrome, it looks fine but when opening in Internet Explorer, it has some overlapping. moment you see how effective publishing textbooks can be. “If you preferred Richard Bach’s ‘Illusions’ or Og Mandino’s ‘Greatest Salesman,’ this book is a Must. These topics are so coinfsung but this helped me get the job done.